For a man who played single notes on his guitar for the first two years before learning chord progressions Steve Hackett has certainly gone on to have a prodigious career as both an accomplished guitarist and composer. Like Rip Van Winkle many fans from his Genesis days will have woken up around 2012 when he rejuvenated some of his former bands classics through the ‘Genesis Revisited ll’ release and accompanying tours. After their long sleep they will have rubbed their eyes looked out of the window and realised that this is an individual who is still at the top of his game. So will his 26th solo studio album At The Edge Of Light show that he still has the creativeness, dexterity, and pedigree to warrant a place at the top table by capturing our imagination? 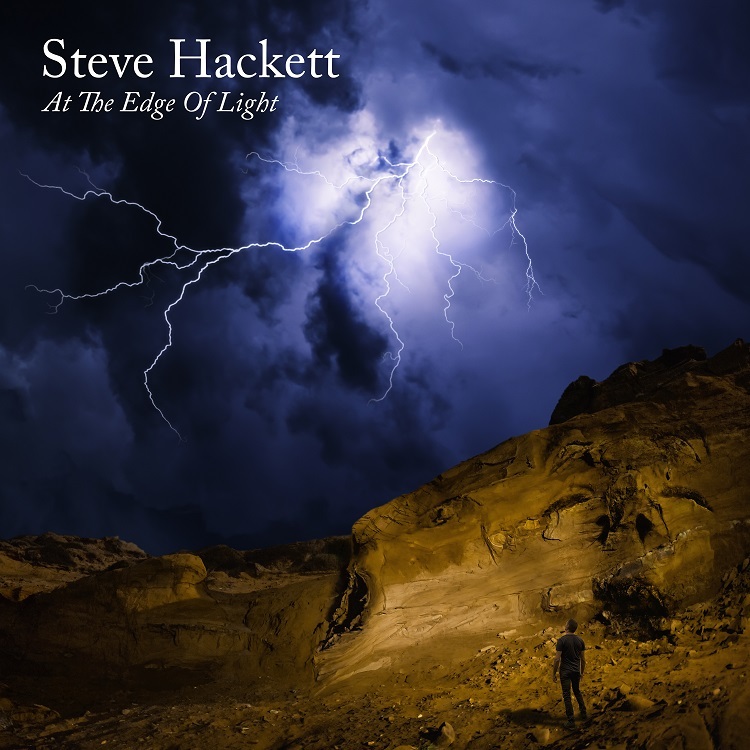 Grandiose prog rock is no longer the order of the day but what Hackett delivers is world music which keeps the listener engaged from beginning to end with the album taking you on a journey without the need to even leave home. This is in no small part due to the stellar global cast of extraordinary musicians that have contributed some sublime moments courtesy of instruments such as the didgeridoo and the sitar allowing multiple experimentation with ethnic sounds and tones. The evolving instrumental ‘Fallen Walls And Pedestals’ is a sublime introduction with its Russian rhapsodic sounding orchestral groove moving between dark vibes and a seering guitar solo fusing it all together. The finesse of the flute and tenor sax set a haunting devilish ambience to ‘Beasts in Our Time’. Capturing the worrying way in which the world is seeping towards a dangerous point and may already have gone too far. There are no holds barred here as Hackett pictures malevolent forces at work right now dragging the world towards disaster. Here’s a man really pushing the envelope with his depressive worries. However fear not as a cautious optimism pulls the music out of darkness as the album progresses. The fire starts to burn more positively on ‘Under The Eye Of The Sun’ with seismic shifts from one style to another. Inspired during his travels the picture painted is all about how some of earth’s greatest creations have been sculptured by time itself. Hackett’s soft vocals enthuse a sense of joy and wonder at the sights he has seen. Cleverly creating a pacey number with the aforementioned didgeridoo at the core with its droning rhythm breathing a chilling interlude. This should be an essential number for his live shows. The global travels move towards India and the River Ganges with ‘Shadow and Flame’ with its eastern inspired themes courtesy of the rhythmic sounds of the sitar. Anyone up for a bit of bhangra dancing? Alternatively the Jeff Lynne sounding ‘Hungry Years’ may seduce you in with its simple melodic almost commercial sounding structure. It has taken almost 18 months to carefully piece together this fresh sounding material with leanings to his musical past but it is the supporting cast who steadfastly raise the bar including contributions from his brother John Hackett (flute), sister in law Amanda Lehmann (vocals), Jonas Reingold from The Flower Kings (bass) and former Spock’s Beard drummer Nick D’Virgilio. However it is long term musical partner Roger King with his songwriting contributions, keyboard playing and orchestral arrangements who has made a huge contribution to the feel and shape of the album. The finale is reached via a linked trilogy of tracks, ‘Descent’ with its bolero sounding military war film beat, ‘Conflict’ akin to a Blade Runner type instrumental film score and the tranquil sounds of ‘Peace’. These all position the fine line between dark and light with the conclusion showing that Hackett still has hopes for the future and that we shall pull back from the precipe. Heavy musings indeed. Steve Hackett has stated that he believes this album is his Sgt Pepper and that will clearly be a matter for the listener to decide. But be absolutely content in the knowledge that the ebb and flow of this wonderful album is a benchmark for all to enjoy with its intelligent approach to adventurous music.